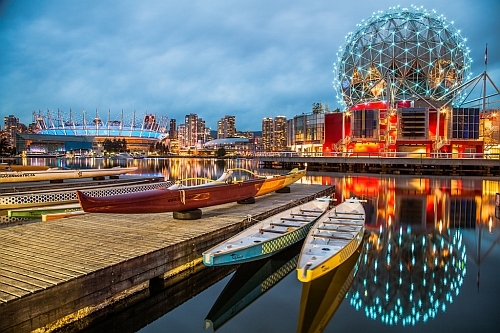 Sunwing has dropped the price of their May and June flights from Toronto to Vancouver down to $299 CAD roundtrip including taxes. 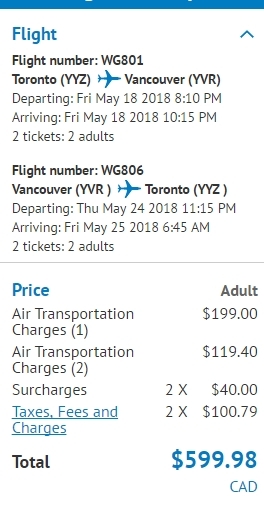 You can also find vice versa trips from Vancouver to Toronto for $329 roundtrip. You can currently find dates near the May long weekend, although you need to come back on the Sunday (such as May 17 or 18 to May 20). Jun 1, 2, 4 -- new! Jun 5, 6, 7, 8, 9, 10 -- new! Jun 11, 12, 13, 14, 15, 16 -- new! Jun 17, 18, 19, 20 -- new! Jun 21, 23 -- new! Jun 4, 5, 6, 7, 8 -- new! Jun 9, 11, 12, 13 -- new! Jun 15, 16 -- new! Jun 21, 22, 23, 24 -- new! - The $299 roundtrip price (per person) is based on 2 people purchasing the flight. Sunwing offers a discount for the 2nd seat on certain dates through their website. For a single seat, the price is $340 roundtrip.